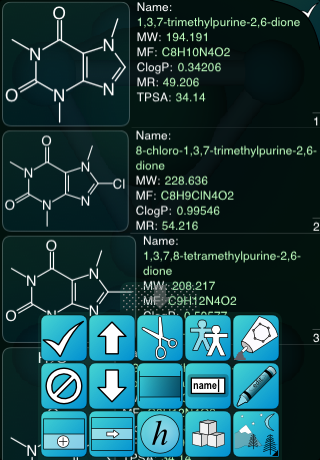 Version 1.4.1 of the Mobile Molecular DataSheet (MMDS) has just been submitted to the iTunes AppStore, and its notable new feature is the ability to select a datasheet and calculate structure-based properties. A new column is created for each selected property, and the calculation feature is applied to each row. 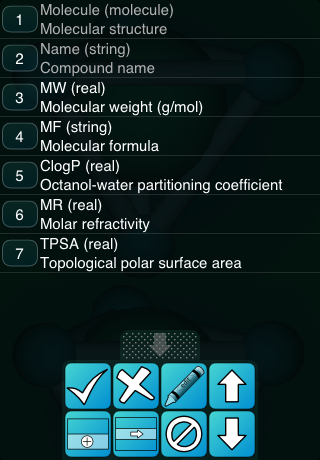 The available properties currently include molecular weight/formula, log P, molar refractivity and topological polar surface area. The functionality is provided by the molsync.com webservice. The properties that can now be calculated for whole datasheets are actually just an exposure of functionality that was originally delivered in the MolPrime+ app (and see slide #7 in ACS presentation in Philadelphia 2012). 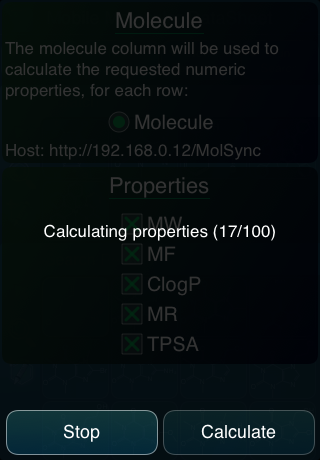 The to-do list has since included the ability to perform these calculations from within MMDS and apply them to a whole collection of molecules in one go. The configuration is rather simple. 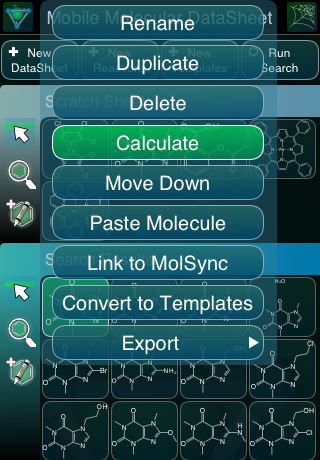 Most non-reaction datasheets have just one molecule column called Molecule. The procedure contacts the webservice (in this case set to a server on the local network, but usually http://molsync.com) to fetch a list of the available properties, which at the current time includes the five properties mentioned above. On the right is the schema view of the same datasheet, which indicates the 5 new columns that have been created. This new feature is quite useful in its own right, but it is an omen of things to come. The com.mmi software stack (which powers the molsync.com service engine) is growing in sophistication. Right now the numeric properties that it can provide are fairly simple older implementations of popular algorithms, but many more are on the drawing board. MMDS has long had access to webservices baked into it, but the original feature trades convenience against the flexibility of being able to implement custom services without modifying the app. The more recent addition is much simpler and more convenient to operate, but it uses a much more narrowly defined protocol, which is currently specific to software provided by Molecular Materials Informatics. 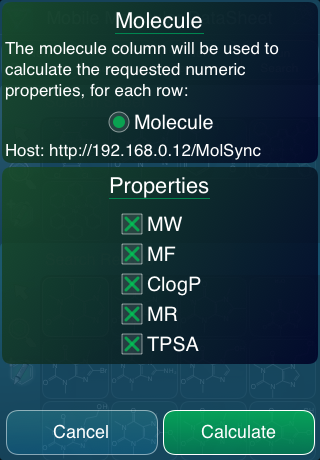 The default configuration routes these webservices requests through molsync.com, across the open internet, but the software stack can be licensed for private intranet use.